The game sells for $17 used and $199 new. The game sells for $45 used and $110 new. The game sells for $8 used and $150 new. The game sells for $9 used and $115 new. The game sells for $48 used and $95 new. The game sells for $40 used and $145 new. Today is international "Talk Like A Pirate Day". To celebrate I'm drinking lots of grog, pillaging my neighbors pantry, and writing a post about Pirate video games. The five most expensive video games with "Pirate" in the title. Plus a few extra beauties for me mates. Shiver me timbers, what a list! A more recent game tops the list of expensive Pirate games. 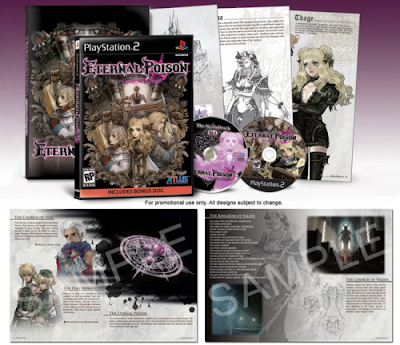 Its a re-release of a PC Action/Strategy game on the PSP. The game received high review scores and is the best way to become a pirate while waiting at a bus stop. A real-time strategy game released for Sega Genesis in 1993. Pirates Gold is one of the few RTS games for the Genesis and is relatively rare. Though it can be found online without much problem you won't see it at many garage sales and pawn shops. The same game as the #1 on our list but released for the Xbox. It is a good game for "Talk Like A Pirate" day. You get to explore, pillage, kill, and steal as the captain of your own pirate ship. George Jetson must take on SPREE (Space Pirates Revelling in Evil Enterprises) and save the galaxy. You don't get to play as a pirate in this game, but it can be fun to stop evil pirates sometimes too. The Wii game version of the last Pirates of the Caribbean movie. You follow the same basic plot as the movie but with waggle controls. Pointing at screen and shakeing your wiimote is guaranteed to make you feel like a real pirate. This game is not one of the best remembered NES games and for good reason, it is completely forgettable. If you want to see an 8-bit Tinker-Bell (and I'm sure there are guys like that out there), this is the game for you. 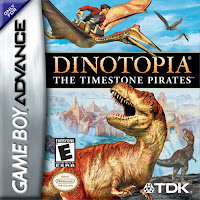 Maybe one of the best Dinotopia games. Ok, that isn't saying much. This might be a good one for your pirate/dinosaur loving kids though. The only Gameboy Advance game to explore the "Pirate Pig" genre. Judging by the picture, Pig Pirates are a bit more generous than human pirates. 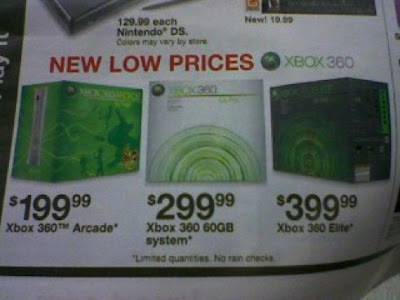 Microsoft officially dropped the price of all Xbox 360 Consoles yesterday. The rumors of a price cut have been circulating since early August on joystiq, ign, crunchgear, and every other video game blog and forum on the internet. 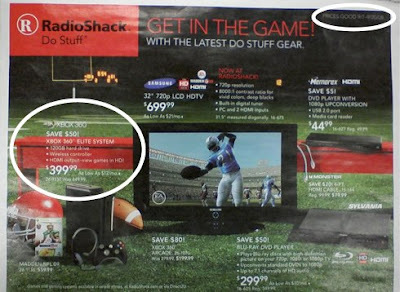 Advertisements showing the new prices even came out from RadioShack and Kmart confirming the 360 prices (seen below). 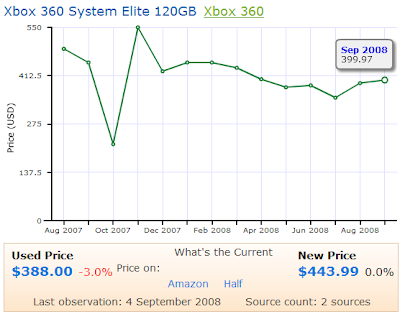 With all the confirmations of the 360 price cuts to $199 for the Arcade, $299 for 60GB, and $399 for Elite, the resale prices didn't change much at all in August. Here is the chart for the 360 Elite's price over the last 12 months. Why didn't the resale prices start dropping with all these rumors? New 360 Elite's are selling for $399 now and the average used price for an Elite is $399 so far in September. The price did drop 3% yesterday to $388 but that is still only $11 less than the new price. I assume the prices will continue dropping now but why didn't they drop earlier? A sealed Myraid 6 in 1 is the featured rare auction. 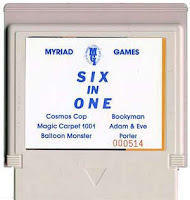 Myriad 6-in-1 is a very rare game for the Nintendo NES and this copy is still sealed and in great shape. The price is too high in my opinion with a buy it now of $25,000! 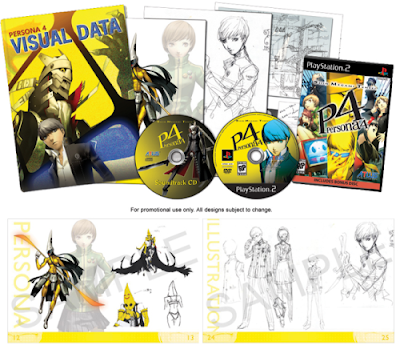 But this would be a one of the ultimate additions to any video game collection. Prior to Friday of last week we tracked Sega CD game prices along with the Sega Genesis console and just added "Sega CD" at the end of the title. This wasn't the best way for Sega CD collectors to find the prices for their games so we changed that. 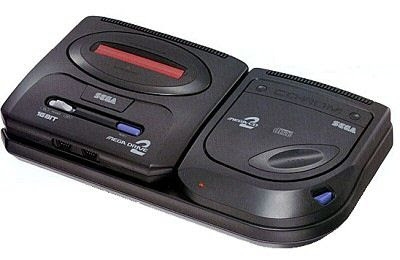 We now have a separate Sega CD page on VGPC with daily updated prices. We also added every single Sega CD game we could find to the site. So we have 129 games with prices right now and 37 more without prices. 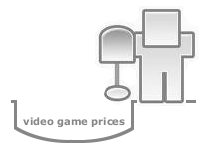 When we find a price on those games we will post them on the live site for everyone to see. 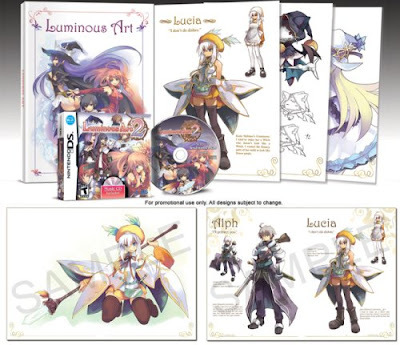 All you Sega collector's out there can now find prices for rare and expensive SCD games like Shining Force CD, Lunar Eternal Blue, and Vay. We plan on adding Atari 2600 to the database later this week due to popular demand. Check back soon to see when we add the system that started it all in console gaming.